19 Because Joseph, Mary's husband was faithful to the law, and yet did not want to expose her to public disgrace, he had in mind to divorce her quietly. We often think of dreams as being fluffy; meringues are fluffy and if you've made the Lemon Fridge Cake and Tree Biscuits, you'll have some egg whites to use. You could make Italian Meringue, and it's tricky so I'll let Monica Galetti (Master Chef and La Gavroche) show you how (click here). Alternatively, you could make little meringues or pipe an oblong shape to fit onto your Lemon Fridge Cake instead of cream, like the one below or a fabulous lemon-meringue pie. For sweet pastry, use 8 oz plain flour to which you will have added and ounce of sifted icing sugar, and rub in 4 oz butter or (hard) margarine or white fat like Trex. You can use half-butter/half marg. When the mix resembles breadcrumbs, add about two tablespoons of cold water. Adjust the amount of water so that you have a good, workable pastry which isn't too wet or too short. Wrap it in cling-film and leave it to rest in the fridge for about half-an-hour. Line a 7 inch flan tin with the pastry and bake blind (not you - keep your eyes open) - at about gas 5, 375F, 190C for about 20 minutes. Remove from the oven, turn down the heat to gas 2, 300F, 140C. Separate 3 eggs and in a small saucepan beat the yolks with 4 oz (100 gm) caster shugga. Add the grated rind and juice of 2 lemons (pop them in the microwave for 30 seconds to make them more juicy). Blend 1 oz (25 gm) cornflour with a little cold water to make a smooth paste with. Pour 1/4 pint (125 ml) boiling water into the saucepan and when it's hot, add the cornflour mix and stir ensuring it doesn't catch. As soon as it thickens, pour into the pastry case. Whisk the egg-whites with 4 oz caster shugga until they form stiff peaks which won't fall from the bowl when you hold it up-side-down above your head. Spread over the lemon mix and bake in the cooler oven for about 30 minutes until crisp and golden. Delia makes a great Lemon Meringue Pie with a richer filling using butta, but this has less fat so must be healthier? 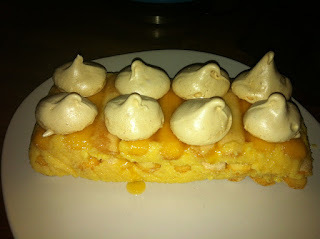 And here's the Lemon Fridge Cake with separately baked meringues on instead of cream. 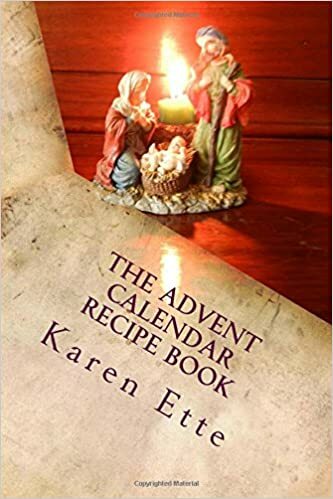 You will find more Advent recipes, Christmas facts and follow the Nativity story, in our Advent Recipe Book, available from Amazon.